Oh, again something from the bicycle equipment area. There are just a lot of projects on the start. 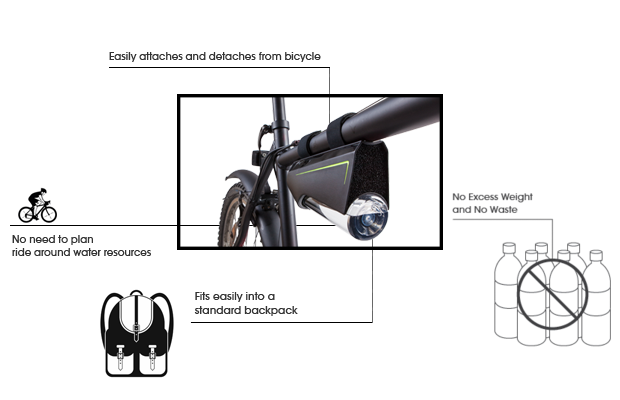 So also Fontus, the self-filling water bottles. Those who prefer traveling in hot weather with the bike (like me) will appreciate a good drop of water. But for longer trips the usual two bottles can sometimes not enough. Ok, such weather you’ll find not often around Hamburg, Germany, where I live.. Nevertheless, such a water shortage during the ride is already stupid. It’s not healthy, you lose power and it lowers the cut. The alternative to bottles of course is a hydration pack. But it have the disadvantage that your back is covered. Sweat-alert. Not everyone’s thing. Personally, I also find to clean the hydration pack is very annoying. The Fontus will now change everything. While Fontus spooks around the web for a longer time, it has now hit indigogo. Fontus is a system, that draws water from the ambient air. Can this work? No idea, but the concept sounds somewhat plausible. The air is sucked into the device and then condensed on to a heat sink. The energy for the heat sink is provided by a solar panel. The system is of course reliant in the water which is present in the air. The amount of the collected water is therefore highly dependent on the ambient temperature and humidity. The warmer it is, the more water can hold in the air and can condense on the heat sink. Fontus is therefore more suited to hot and humid regions. A Sahara crossing I would therefore probably not try. It is indeed hot there, but if there’s enough water in the air is likely to be questionable. So if you have summery 30 degrees Celsius in the summer the bottle will be filled in good 2 hours. Let’s hope, that this is fast enoiugh. There are two versions planned. 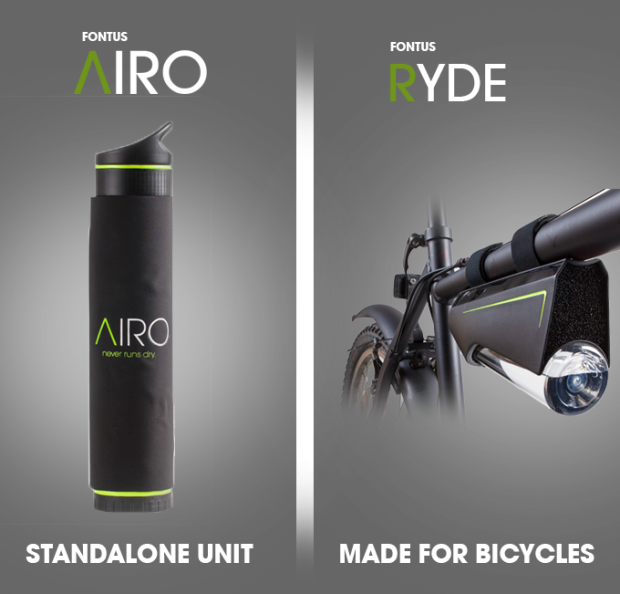 AIRO is a pure bottle variant, for people who want to go with the thing on a hiking tour. The solar cells here are designed as a mat, which can then be hanging over the backpack at the back. RYDE is the bicycle version that is strapped under the top tube. The price is not cheap. For RYDE have to put $ 165 on the table. AIRO will cost $ 225. But that’s not all. $ 70 Shipping costs are called and don’t forget customs and taxation. That’s a bitter drink of water and that’s not all. Although a couple of prototype rounds are probably already so gone, the “final” prototype is not really final. So if least the basic technology has been tested successfully (we can not be sure there), many data for mass production will be still unknown. Even with a final prototype the way to the series is still sown with many pitfalls. Then, when the prototype is not ready yet … gambling. After all, they have put the delivery until April 2017. So you can lean back minimum of one year, before you have to be angry about the usual delays. Fontus is a fascinating concept. If it is realistic? We have to see.. You must also not forget that the water amount Fontus can collect is strongly dependent on temperature and humidity. It may be that the system, even if it works as promised, in your situation can not produce enough water. As such, I would be careful with the your pledge. Ultimately, the good old plastic bottle will work, too. The speed and amount of water depends strong on temperature and humidity.